Children and Their Eating Habits! Feeding your child a nutritious meal is a challenge to most parents. Sometimes, parents would be successful in feeding their child the right quantity of food. Infants and pre-school children are extremely vulnerable and succumb when the diet is poor in quality and quantity. 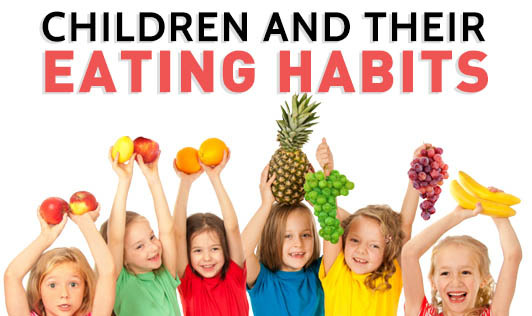 Family, environment, social trends, media, peer pressure and illness or disease affect the food habits of your child. Parents are equally responsible for children's eating habits and table manners. • Watching television with multiple media cues to eat is suggested as a factor in excessive weight gain for children especially in age group of six to seven years. Do not let your child watch TV during dinner. Talk about something interesting that will increase your child's general knowledge or about their day at school. • Neither rigid control nor a lenient approach is likely to succeed. Parents and other care givers should continue to offer a variety of foods including their favorites and substitutions could be made within the same food group. • Pre-school children because of their smaller capacity and variable appetites; do best with small servings of food offered several times a day. • Most children eat four to six times a day, which means snacks should be chosen carefully so that they are dense in nutrients and not limited to biscuits, chips, crisps, colas, chocolates and pastries. • Wholesome snacks enjoyed by many children include fresh fruits, cheese, raw vegetable sticks, milk, fruit juices, whole grain and gram products and sandwiches. • Children should not be given any food or drink within 1½ hours of a meal. It does not take much to satisfy a child's appetite and even small snacks may result in poor eating at meal time. Enjoy your child's eating habits. Do not get angry or try to scare your child to eat. Divert them to topics that they like and motivate them. Cook interestingly to increase your child's interest in food!